People hold placards as they wait for the arrival of trucks with international humanitarian aid for Venezuela near the Tienditas cross-border bridge between Colombia and Venezuela, in Cucuta, Colombia, Feb. 7, 2019. The placard reads, "Maduro out." U.S. special envoy for Venezuela, Eliot Abrams, says the time for talks with President Nicolas Maduro "has long passed" except to negotiate his departure. Abrams told reporters Thursday at the State Department that Maduro has "friends" in Cuba and Russia. He also said several other countries that he did not name have offered him asylum. Abrams announced the U.S. has revoked visas for some members of the Venezuela's constituent assembly, whose job it is to put together a new constitution. The opposition and many Venezuelans say the 2017 election called by Maduro to elect members to the body was rigged. 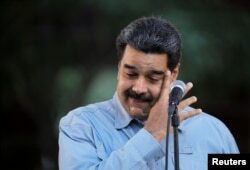 Venezuela's President Nicolas Maduro attends a gathering in support of his government in Caracas, Venezuela, Feb. 7, 2019. Meanwhile, the State Department says it is procuring and pre-positioning food, medical supplies, and other humanitarian aid to send into Venezuela at the request of opposition leader and self-declared interim president Juan Guaido. It calls on Venezuelan security forces to allow the aid into the country. Maduro has ordered soldiers to stop supplies from crossing a bridge between Colombia and Venezuela. A giant tanker and two large shipping containers are sitting in the middle of the bridge, blocking any attempted delivery. Fuel tank blocks the vehicular passage on Tienditas cross-border bridge between Colombia and Venezuela, in Cucuta, Colombia, Feb. 6, 2019. A spokesman for U.N. Secretary-General Antonio Guterres said Thursday "humanitarian aid should never be used as a political pawn" and must be carried out in "accordance with the principles of humanity, neutrality, impartiality, and independence." European and Latin American diplomats meeting in Uruguay said Thursday Venezuela's problems need to be solved without violence and foreign intervention. They say it is up to the Venezuelan people to find a resolution. Maduro has so far refused any suggestions to hold early elections and is refusing to go. He was inaugurated for a second six-year term last month after an election the U.S. and opposition called a sham. 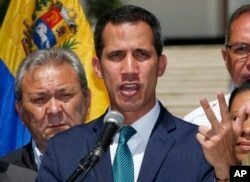 FILE - Opposition leader Juan Guaido, who has declared himself the interim president of Venezuela, speaks during a press conference on the steps of the National Assembly in Caracas, Venezuela, Feb. 4, 2019. The U.S. was the first to recognize Guaido as the president of Venezuela, followed by many other Latin nations, Canada, and European powers. President Donald Trump has said a military option for Venezuela is still on the table. The collapse in world energy prices along with corruption and failed Socialist policies has wrecked the Venezuelan economy. Food, fuel, and many basic goods are in severely short supply and inflation is out of control. Millions of Venezuelans have fled the country and millions more can be expected to go.